Helping Heart Families » Anna - Gavin's Got HeartGavin's Got Heart - Our mission is to spread congential heart defect (CHD) awareness while offering support to families with children affected by CHDs. 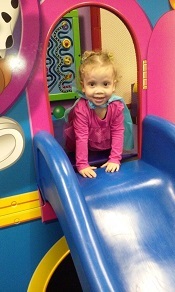 Anna was born with a large atrial septal defect (ASD) and a large ventricular septal defect (VSD). At only one-month-old, she underwent open-heart surgery at Cohen Children’s Medical Center. The surgeon placed a patch to close the ASD and a partial closure of the VSD was performed. Ten days later, just two days before Christmas, they sent this little warrior home. Two years later, the family is happy to report that Anna is doing well and the small VSD that was left has almost closed on its own.